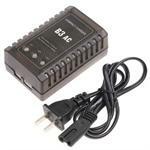 QN-012DC: DC Smart-Fast charger for 7.4v Lithium Polymer & Lithium ION battery packs. Plugs into 12-13.8VDC DC socket; has JST charging connector built on; contains high-grade SONY smart-detect IC system for 7.4v Li-POLY & Li-ION chemistries. Charging rate averages approx. 600mA/hr. Buttonless operation; has LED indicator to show "charging" and "done" status. Shuts off automatically when battery is full. 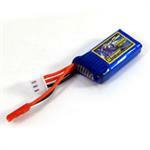 2LP452030P6H: 7.4 volt 250mAh rechargeable Li-PO battery for RC electric. Pack size = 30mm L x 20mm W x 9.0mm thick (1.18"L x 0.79" x 0.36" thick). Weight = 9 gms (0.32 oz). 2S1000D: 7.4v 1000mAh LiPO with red T connector. Size: 2" x 1" x 5/8". Weighs 3 ounces. 30C-35C continuous output. 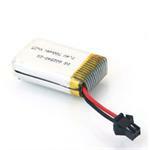 2S1000JST: 7.4volt 1000mAh LiPO battery for RC electic flight. Weight 1.9 ounces. Size: 2" x 1" x 5/8". 25C discharge capability. Includes Red JST motor connector and White balance charging connector. 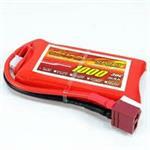 2S2300T: 7.4 volt 2300mAh 350C Li-POLY battery for RC electric motors. Includes motor connector and balance charge connector. 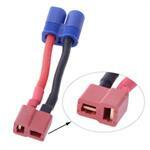 Red T ultra connector is shown. Choose others from menu. 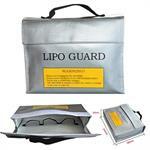 2LP455590P5H : 7.4 volt 2300mAh high-capacity Lithium Polymer battery pack. For Park Flyers / Slow Flyers / RX use. 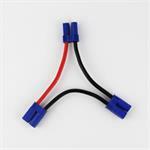 The 2LP455590P5H is a 7.4 volt 2300mAh rechargeable Lithium Polymer battery pack w/ red JST connector. 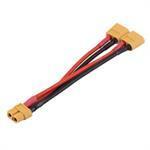 Size: 90mm L x 55mm W x 9.0mm thick (3.54"L x 2.165"W x 0.354" thick). Weight: 80 gms. SPECIAL WEB SALE - base price $19.95 each. 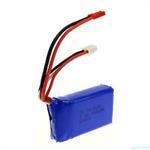 2LP723512 - rechargeable 7.4 volt 1000mAh 20C Li-PO battery pack for R/C models. 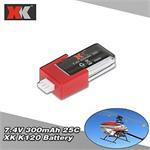 Ideal for powering electric flight. 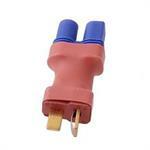 Sized 72mm x 35mm x 12mm - for smaller applications.